Anubis is the God of Cemeteries and Embalming. 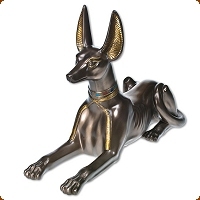 Anubis is normally seem as a jackal or dog or in jackal-headed human form. He is normally depicted in black, and the colour is symbolic, it represents the colour of the body after the mummification process. Black is also associated with the fertile Nile silt deposited on the land, called the 'Black Land' and hence rebirth in the afterlife.